The 2017 MERAC Prizes for the Best Early Career Researcher are awarded in New Technologies to Dr Emmanuel Hugot for his unique and pioneering work on innovative astronomical instrumentation, based on active systems, freeform optics and curved focal planes. 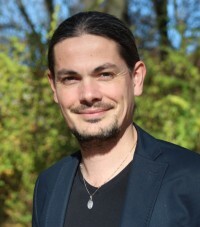 Emmanuel Hugot is a French astrophysicist, expert in innovative instrumentation and, since 2015, leader of the Research and Development Group at the Laboratoire d'Astrophysique de Marseille (LAM). In 2004, he completed his Master Thesis on "Optics, Image and Signal" at the Aix Marseille University (AMU) and started a PhD Thesis completed in 2007 at the LAM. He has been awarded the young researcher prize of the French Society of Astronomy and Astrophysics in 2014, and received in 2017 the CNRS bronze medal delivered to early career scientists. He defended his accreditation Thesis at AMU in 2016. Besides his management activities with the science team at LAM, he is now leading an ERC-funded programme to enable compact, high-quality and affordable instrumentation for the future giant observatories, based on the revolutionary combination of freeform optics and curved detectors. Emmanuel Hugot's interests in instrumentation are broad, from the manufacturing of super-polished freeform optics for cutting-edge instrumentation, to the development of a new type of focal planes using variable curvature detectors, thus leading to compact and cost-effective instrumentation, crucial for the E-ELT or the post-JWST generation such as the LUVOIR observatory currently under study at NASA. Over the past ten years, he has been leading cutting-edge R&D projects for high angular resolution and high contrast imaging, based on the synergies between active and adaptive optics, materials science and innovative focal plane architectures. His work has also a multi-disciplinary impact, as it involves imaging science with applications in many fields, from bio-medical science to artistic projects. One of his main achievement is the concept and building of the first active mirror ever used in an extreme adaptive optics system. Installed in 2015 on the Spectro-Polarimetric High-Contrast Exoplanet REsearch (SPHERE) instrument of ESO's Very Large Telescope (VLT), this system demonstrates the gain of smart flexible optics for sharp and accurate astronomical observations and triggered worldwide interest on this technique. The work of Emmanuel Hugot has been conducted entirely at the Laboratoire d'Astrophysique de Marseille, a world-leading lab in the field of astronomical instrumentation, but with international and industrial collaborations, clearly enhancing the impact of his activities.